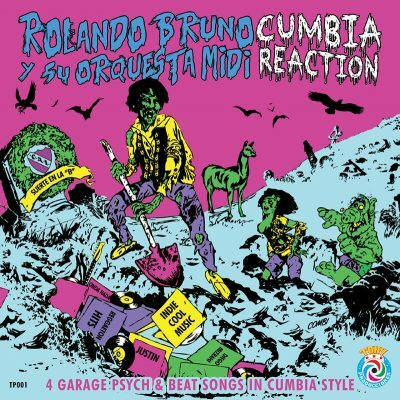 This Cumbia Reaction EP is a true gem among the rough. Hailing from Buenos Aires, Argentina, Rolanda Bruno—formerly of Los Peyotes—comes blasting out with his one-man-band act. Unlike Los Peyotes—which is amazingly raw 1960’s-inspired garage punk music—Bruno brings out something different through this cumbia trash with a mix of psychedelic garage rock and Latin funk. This is his first release since 2013 and was recorded by Bruno at his Midi Home Studio. It’s an infectious four tracks that will keep you moving about like an idiot, as if being hexed. Other garage rock follows a pattern by endlessly copying the same primitive riffs with the desire to be raw but familiar. With so much out there to digest, it is understandably difficult to find a style that truly stands out. Luckily, there is Bruno, who takes garage rock and twists it into music that not only pushes boundaries with its unique psychedelia-meets-Latin infusion, but also with impunity. This is evident with Bruno’s first track on this EP “A 5 años de acá,” a solely instrumental number. Mid-to-high tempo, this track has a strong buildup that gets one grooving. It’s a solid intro to the rest of the EP. “La Gente Así” continues on a similar energy. However, combined with Bruno’s vocals and heavy percussion, I have a strong desire to whirl about the room and give in to reckless impulses. This track exemplifies a mix of garage rock and cumbia. “Te Puedes Quemar” is probably my favorite track on Cumbia Reaction. It’s got heavy fuzz guitar that provokes an edgy, angsty attitude—while keeping the grooving dance beat alive and thriving. I urgently suggest that playing the song with the volume knob in the red is the way to go. If this doesn’t inspire folks to move about, then there is something deeply wrong—so keep playing it. “Pronto un Doctor” is another great mover and groover track. The fast-paced tempo is easy to get lost in. Bruno’s voice is smooth and captivating. Like other tracks on the EP, it captures the essence of psychedelic garage rock and Latin funk and blends them into something controlled, yet wild and fun. I have to say that everything I’ve heard so far from Voodoo Rhythm Records is refreshingly brilliant. Cumbia Reaction fits perfectly with the Bern, Switzerland-based array of strange, rebel-inspired garage rock. This isn’t any pretentious indie stuff. This is the kind of music that still has soul in it.